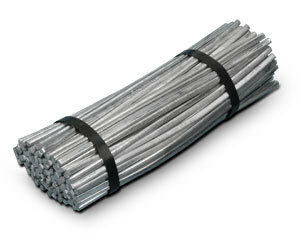 Sticks form part of our wide range of filler metals for soft soldering. These products are used for applications such as building and all types of manufacturing. Waste originating from the use of these products can be recycled. The sticks are made from primary quality metals. Their shape is particularly suited to plumbing work, accessories for sheet metal work and car bodywork. They are also suitable for industrial use in the assembly of various metals such as copper, brass, tin and zinc. The METACONCEPT Group collects used baths, off-cuts, scraps and white metal oxides. This table shows the most commonly used alloys. For other types of alloys, please contact our technical department. The dimensions and weights are given for informational purposes only and may vary depending on the production run. Used on aluminium and its alloys. Apply Aluflux flux for this application. The product safety datasheet below is available on request from the METACONCEPT Group. The parts to assemble must be clean (deoxidised and degreased). Apply the appropriate flux to the parts. Heat the parts using a propane or acetylene torch, or a soldering iron. The parts must be brought to a temperature of around 15 to 20°C below liquidus. Allow the parts to cool without moving them. When the parts have returned to room temperature, brush the soldering beads using a metallic brush. If necessary, clean the assembly with clean water or water with a touch of citric or formic acid (1 to 2%).